So, you have been told about catastrophic health insurance plan. You now think all is going to go well as you can buy one catastrophic health insurance plan and you are sorted at least for a short time period. 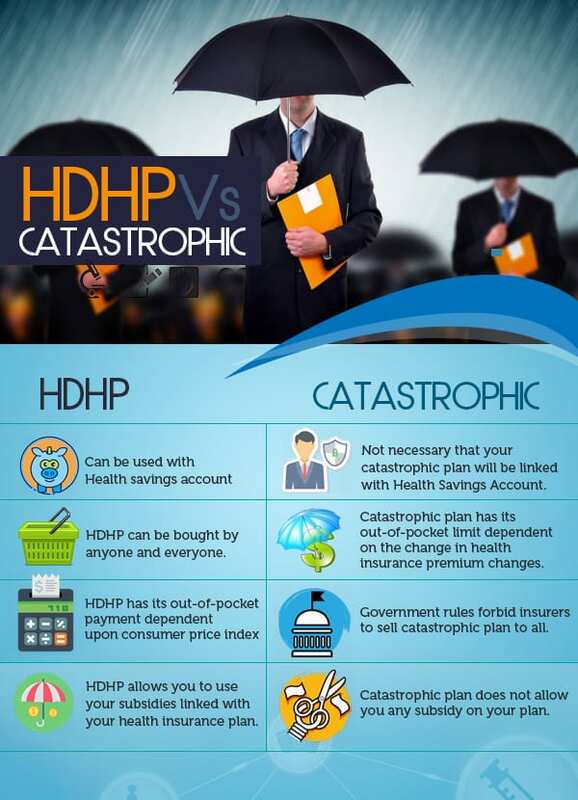 While doing your home work on catastrophic plan, you were given the idea that both catastrophic and high deductible health insurance plans are one and the same. If you are planning to buy your medical insurance plan depending upon that, it is better you do some serious research on the two plans. You may have an HDHP under bronze, silver, gold, or platinum plan, yet all these four plans don’t allow catastrophic plans to be eligible subscriptions. Let us say you got a high deductible plan and also bought an HSA (health savings account) with it. You now know your HSA will allow you to continue cost assistance even after you are 65 years old. Under HSA, you have many benefits like, discontinuing HSA for even a year or more, you can still reconsider adding to the account. All you need to do is let the account stay dormant with your plan. Take a catastrophic plan which works similar to your high deductible health insurance plan, and you will not be entitled to HSA. In fact, no HSA is assisted with a catastrophic plan. Hence, your catastrophic plan is simply a short term assistance that will help you to fill gaps between your actual plan. You cannot expect a lifetime assistance from it. In case you earn enough not to be eligible for Medicaid but you are entitled for various subsidies (as you are marginally above FPL or Federal Poverty Level), you are entitled to your subsidies as long as you buy a high deductible health coverage. If you choose the other option, catastrophic that is, you will get no subsidies like prescription drugs discounts, preventive care for free, and other conditions assisted with subsidies. You are free to buy any HDHP during Open Enrollment, or in case of Special Enrollment (under special conditions). You do not have to go through certain eligibility criteria to be eligible. In catastrophic, you are first required to be under 30 years of age. Plus, your employer-based plan is getting discontinued due to a valid reason or two. Or else, you wish to fill in between two plans, only then you will be allowed to buy this plan. Else, you have no ways you can buy this plan. When out-of-pocket limit gets calculated for HDHP, it is based on the consumer price index. In other words, how much the total amount consumers are spending on out-of-pocket is the basis point for the maximum limit. In case of catastrophic, you will have to check average change in health insurance premiums in the year. Your out-of-pocket maximum can be between the average of the new amount and the previous amount you pay towards your premiums. Catastrophic had its maximum out-of-pocket at $6,600. If you had a plan with higher out-of-pocket and lower deductibles, you will be ineligible with catastrophic plan. Only when your out-of-pocket and your deductibles are the same, you will be able to apply for catastrophic plan. In case of HDHP, you are eligible independent of the whether your out-of-pocket and deductibles are same or different. A little research goes a long way to help you from committing unnecessary errors. After all, when it is about health insurance industry, it is about a lot of money involved. So, a lot of caution has to be maintained before taking the complex plans and their jargon for granted.